Written by Catherine Saxelby on Thursday, 12 August 2010. 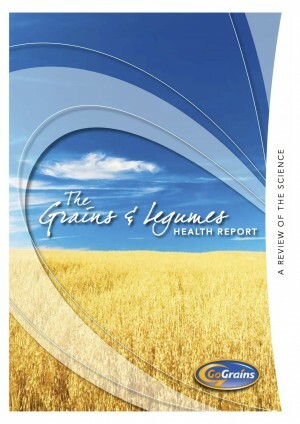 In April 2010, GoGrains released a report named ‘The Grains and Legumes Health Report'. It's a 27 page A4-size book that can be ordered or downloaded free from the GoGrains website. It gives you an overview of the latest scientific research about grains, legumes (dried peas, beans and lentils) and health. The report reviews the health benefits of wholegrains and legumes with regards to cardiovascular health, type 2 diabetes, weight management and cancer. Here we present a short summary for students and teachers. Wholegrains, and increasingly legumes, appear to play a role in protecting against heart disease, type 2 diabetes, certain cancers and obesity. Interestingly, research indicates wholegrain foods may help prevent asthma and gum disease, and may also improve mood and cognitive (brain) function. The report was written jointly by GoGrains Health & Nutrition and Associate Professor Peter Williams of the University of Wollongong. Eating 2 to 3 serves of wholegrain foods a day can reduce the risk of developing cardiovascular disease, type 2 diabetes, certain cancers and obesity by 20 to 30%. Eating 2 to 4 serves of wholegrain foods a day can reduce the risk of heart disease by as much as 40%, equal to the effect of cholesterol lowering drugs. Wholegrain foods can help lower blood pressure. A diet that includes frequent consumption of wholegrains may reduce the progression from impaired glucose tolerance to type 2 diabetes by up to 58%. A diet high in wholegrains is associated with a lower Body Mass Index (BMI), waist circumference and risk of being overweight and can assist in weight loss as part of a kilojoule controlled diet. Epidemiological studies consistently show that eating legumes can help reduce the risk of cardiovascular disease, diabetes and obesity as well as improve gut health. Eating legumes four times or more a week, compared with less than once a week, has been shown to reduce the risk of heart disease by 22% and cardiovascular disease by 11%. "the intact grain or the dehulled, ground, milled, cracked or flaked grain where the constituents - endosperm, germ and bran - are present in such proportions that represent the typical ratio of those fractions occurring in the whole cereal, and includes wholemeal" (page 5 of the Report). Wholegrain products vary in the amount of wholegrains they contain. You'll generally see information about the wholegrain content on the label. Products labelled as ‘wholegrain' are required to state the proportion of wholegrains they contain (expressed as a percentage) in the ingredient list. (This is not an official Government recommendation but a guide to help you measure how much you're eating). The table below (taken from page 7 of this Review) includes examples of wholegrain foods and their approximate wholegrain content.